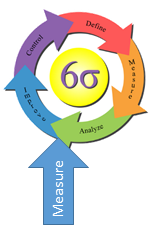 In the beginning of Six Sigma there was MAIC: Measure-Analyze-Improve-Control. Then General Electric added Define. And that’s where things have been for 25+ years. Six Sigma is DMAIC. There’s just one problem: it doesn’t work very well for teaching purposes. DMAIC as a framework for executing Six Sigma projects works just fine. I’ve led hundreds of DMAIC projects and reviewed thousands more for certification and other purposes. But teaching Six Sigma in the DMAIC sequence is problematic and should not be done. When I teach Six Sigma I break the Measure phase in to two distinct sets of lessons. The first set of Measure topics is largely non-technical. I teach students how to understand and interpret variation, what measurements are, operational definitions, scales of measurement, etc.. I also teach them how to sample and collect data and use it to measure the current baseline and to perform exploratory data analysis to let data talk to them. I also teach the use of simple descriptive statistical methods to display properties of data distributions such as central tendency, spread and shape. I show students how to use existing and newly collected data to drill down from higher levels of cause-and-effect to more granular levels by using stratification. I teach about the pros and cons of using historical data. These Measure tools help students to develop theories and do some preliminary work in checking their theories with facts and data. They are mainly graphical: run charts, histograms, boxplots and the like. Some statistics are used to quantify otherwise vague concepts such as “center” and “spread.” I view the first phase of Measure training as something of an extension of the Define phase. However, where Define focuses on the project, M1 concerns itself with the process. It is where the team puts the project definition to the test by using data. The deliverable from M1 is a more detailed process definition and a rough model of how the process creates the outcome which the project aims to improve. Measurement Systems Analysis (MSA) is the rigorous evaluation of measurement systems. When an MSA is completed we will be able to categorically answer the question: can the measurement system adequately characterize the process on which it is being used? In the case of Green Belts this question is answered using control charts and their associated statistics. Black Belt training goes deeper and partitions the variation into variation in the process and variation from other sources, such as different inspectors and repeated readings. In both the Green Belt and Black Belt cases the MSA is, in essence, a designed experiment. Even though Green Belt training doesn’t cover the statistical analysis of designed experiments, it does cover the proper design of experiments. It also covers how to properly control experiments to assure that the results are not contaminated with variation from unintended sources. Now, the proper design and control of experiments are properly taught during the Analyze phase. This includes teaching things such as special and common cause variation, tests of hypotheses, partitioning of variance, statistical modeling, p-tests, statistical error, and much more. In short, from a teaching perspective M2 training needs to come after the student has learned the topics taught during the Analyze phase. When the traditional DMAIC approach to teaching Six Sigma is used, all of the Measure topics are presented immediately after the Define topics. When this approach is used instructors must cover many topics from the Analyze phase. This leads to confusion in the minds of students between the two phases of Six Sigma. Separating Measure into M1 (which uses simple descriptive and graphical tools to explore existing data) and M2 (which uses designed experiments to rigorously characterize measurement systems) allows the instructor to lay the groundwork needed to understand what is being presented. When training is complete and projects are actually being done, the Green Belt or Black Belt should use the traditional DMAIC approach. But the DMAMIC approach should be used to teach.